Updated by Zoey Miller and verified by the thebabbleout.com Research Team. Last updated on September 4, 2018. Every part of your baby seems so delicate, doesn't it? So, when it comes to taking care of their hygiene, new parents need all the help that they can get. Teeth and gums can be especially challenging to clean for many parents. When the teeth are coming in, the gums of your baby are so delicate that if you use a wrong brush to clean them, you can easily cause an injury. 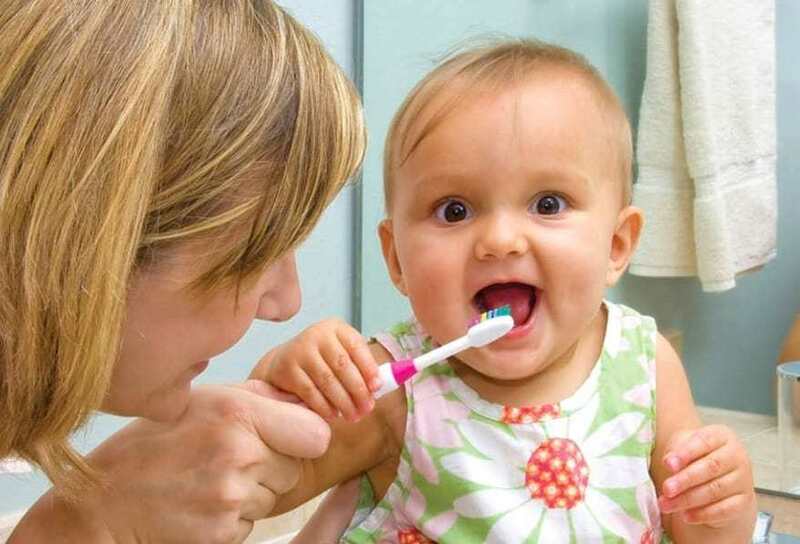 Furthermore, your baby is not going to be able to brush his/her own teeth when the teeth first start coming in. So, you are the one who is going to brush them. In that case, the choice of a toothbrush becomes even more crucial. You need a toothbrush that you can use to clean your baby's teeth completely and yet gently. Thankfully, there are many options on the market when it comes to baby toothbrushes. However, as with most things, too many options can make picking the right toothbrush difficult. Well, that's where this article comes in. ​Should you be brushing your baby's teeth? When should you start brushing your baby's teeth? How to use a toothbrush? What toothpaste should you be using? What to look for in a good baby toothbrush? Now, this is an important question to answer. Many parents have this question on their mind when their baby starts to teeth. Well, as it turns out, you should be brushing your child's teeth as soon as you see some teeth sprouting out. You see, when your baby has no teeth, cleaning your baby's mouth is quite easy. All you do is take a soft cloth, soak it in clean water and run it over the gums of your little one. However, when the teeth start coming in, the cloth trick just doesn't get the job done. With teeth coming in, it can get quite difficult to reach all the parts of the baby's mouth with a cloth around your finger. What you need is a good, soft toothbrush. The toothbrush that you choose should have a small head and soft bristles so that you can reach all parts of the baby's mouth and clean the teeth as gently as possible. According to experts, you should start brushing your baby's teeth as soon as you see teeth poking out from the gums. While it may take some getting used to, but you should try to incorporate brushing teeth in your baby's daily routine as soon as possible. 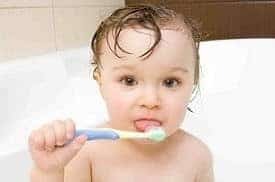 Another confusing thing for most parents, when it comes to brushing the teeth of their baby, is the technique they should be using. Now, as far as the technique is concerned, you should brush your baby's teeth in small circular motion. It is also important to make sure that you are brushing the whole tooth, especially the part where it meets the gums. Once the brushing is done, you can encourage your baby to spit out the toothpaste. Another point to remember is that if you are using a fluoridated toothpaste, you don't need to rinse your baby's mouth right after. A little residual fluoridated toothpaste is safe for the enamel of the teeth. The fluoride reacts with the enamel of the tooth to form a hardened layer and helps prevent cavities. First and foremost, you should exclusively use toothpaste that is formulated for babies. Although some parents like to use the same toothpaste as they use for their children, I would strongly recommend using the baby toothpaste. The second thing to remember is that the baby toothpaste should have fluoride in it to prevent tooth decay and caries. However, it is important to have the right level of fluoride that is safe for the babies. Usually, you can find the amount of fluoride present in the toothpaste on the packaging. For children under three years of age, the fluoride content of the toothpaste should be below 1000 ppm (parts per million). Another important thing to remember is that many babies like the taste of the toothpaste and would tend to eat it. You should actively discourage your child from eating toothpaste. A good toothbrush for your child has many desirable features. While some toothbrushes on the market check all the right boxes, some others don't. Here are some of the features that you should be considered while selecting a toothbrush for your baby. It goes without saying that the bristles are the most important part of a toothbrush. The bristles are going to be in contact with your baby's teeth, and gums and hence both their quality and safety is crucial to consider. The first thing to note is whether the bristles are soft or not. You don't need a brush with hard bristles that can scratch and scrape your baby's delicate gums and cheeks. That said, the bristles should be sturdy enough to withstand brushing and should be able to get the teeth clean. Another important thing to note is the material from which the bristles are made. As I said earlier, the bristles are going to be in your baby's mouth, and he/she is inevitably chewing on them. You want the bristles to be made from a material that is non-toxic, and hypoallergenic. Toothbrushes for babies come in two distinct types. The first type looks pretty much similar to your own toothbrush. It has a head with bristles on it and a handle. The second type is sometimes called a finger brush. As the name suggests, these brushes can be worn over your fingers and have bristles on end. While both types of brushes and efficient in getting your baby's teeth clean, the choice depends on your personal preference. One thing that I would like to point out here is that if you use a brush with a handle, it can be easier to teach your child how to brush his/her own teeth later on. The size of the toothbrush is also quite important to consider. You want your baby's toothbrush to have a small and more or less rounded head. As your baby's mouth is quite small, the smaller head can reach all the places and can get the most efficient cleaning done. Also, make sure that the handle of the brush is also easy to hold and use. Many brushes on the market have some weird handles on them that can get extremely uncomfortable to use. Stay clear from such brushes. Chances are, your baby is not going to be thrilled about getting his/her teeth brushed! So, if a brush has a fun design, it can help you to coax your baby to get the brushing done. There are many cute and fun brushes on the market that your baby may find interesting and you should look out for them. That said, don't go for the too fancy kind as such brushes can be very impractical to use. We all like to hear an expert's opinion on any baby product that we use, don't we? There are many toothbrushes on the market that have pediatricians endorsing them. I am not saying that if a toothbrush is endorsed by a pediatrician, then that is automatically the best, but having such recommendation is certainly a plus point. The Radius Totz brush is one of my favorite toothbrushes for my son as it is very comfortable and easy to use. The bristles of this toothbrush are very soft and made from a BPA-free material. As a matter of fact, the bristles are not made from plastic at all; they are made from a vegetable based material that is non-toxic and safe to use. Although this toothbrush is not designed for infants, it is a perfect first toothbrush for your toddler. It is ideal for a child who is 18 months of age or older. I also like that the handle is wide and oval in shape. It is easier for a child to hold and use. There are over 4,500 bristles on this brush which makes cleaning teeth easy and efficient. The brushes are available in multiple attractive colors as well. They come in a package of three toothbrushes and are surprisingly affordable given the quality. Hands down, the Baby Banana is one of the most beautiful looking toothbrushes on the market. With its eye catching yellow color and a fun banana shape, your baby is sure to love this thing! The toothbrush features soft and wide bristles that help to clean and massage the teeth at the same time. The brush is designed so that your baby can use it as a toy and can even chew on in to soothe sore gums when she is teething. The brush is completely dishwasher safe and can be used to from 3 months of age to a year. If you don't like the bright yellow color, they also have a wide variety of colors to choose from as well. The plastic used in the brush is a 100% BPA and Phthalate-free. So, you don't have to worry about your little cherub gnawing at it for hours! The first thing that stands out in this baby toothbrush is the design. It has a distinctive design with attractive patterns on it. Although the head of the brush is small, the handle is wide and oval shaped with a hole cut out in the center. The Jordan Step1 makes a great toothbrush as well as a teether as well. The handle of the brush can double as a teething ring that your baby can chew on to soothe the sore gums. The brush is made from a non-toxic, BPA and phthalate-free plastic material that is completely safe to use. The bristles are also very soft and also have a colored indicator for the amount of toothpaste to be used. The small head allows the brush to reach even the most difficult to reach parts of your baby's mouth. The brush is suitable for children from 0 to 2 years of age. The attractive design and patterns on the handle will keep your baby engages and interested. The first thing that you will notice with this brush is the unique H-shaped design on the head as well as the handle. The brush has an easy to hold handle that is perfect for an infant. The brush has a wide head with softer bristles that your baby can stick in her mouth and chew on. The unique design of the brush makes it a six-sided brush as it has cleaning soft bristles on all the sides of the head. As the bristles are super-soft, your baby will not have any problem gnawing on them. The whole brush including the handle is made from an FDA approved silicone making it safe to use. The Mom Miya toothbrush is specifically designed for children that have just started to teeth. It is intended to resemble the shape of your finger and hence is an excellent way to transition from cleaning your baby's mouth with your finger to a toothbrush. The toothbrush features a clear plastic design that has soft bristles on one side and small knobs on the opposite side. The bristles are very soft and comfortable, and the knobs on the opposite side act as teething chew. The baby can chew on the brush to soothe the pain and uncomfortable feeling when the teeth start to emerge. The toothbrush comes with a set of three which is a great bargain. It is also available in multiple attractive colors and also comes with a protective case. Picking the best toothbrush for your baby can be quite a task. After carefully testing out the top 5 baby toothbrushes on the market, the Radius ﻿﻿Totz ﻿﻿Toothbrush easily takes the top spot. The Radius Tots features a great ergonomic design and soft bristles. The brush is made from a 100% BPA and phthalate-free plastic and features an easy-to-hold design. If you are looking for the first brush for your toddler, look no further. The Radius Totz is the best brush that you can buy. If you loved reading this article, please share it with your friends and family and help us reach as many readers as we can.